With Decepticon super robots threatening to pound cities � and even entire civilizations � to dust, Optimus Prime masters the power of the Combiners to stop them. Together, he and the Autobots will prove that courage is stronger when combined. Boy oh boy, when Hasbro designed the Combiner Wars line, they must have been frothing at the mouth for all the repaints. If I count correctly, this mold was initially used as a straight up red and blue Optimus Prime (Ultra Prime), Motormaster (Menasor), G2 Motormaster (Menasor), and Unite Warriors Motormaster (Menasor). Enter �Battle Core� Optimus Prime. A repaint of the first use of the mold, albeit with a new head. Talk about getting your money�s worth! As I understand it, Battle Core Optimus Prime was basically shoe-horned into the IDW universe to sell toys. I get the impression that Optimus Maximus was a one-off in the comics - serving a sole purpose - never to be heard from again. Optimus Maximus is �traditionally� composed of BC Optimus, Prowl, Ironhide, Sunstreaker, and Mirage. The beauty of the CW line is that it doesn�t have to be that way if you don�t want it to be. I saw this guy in mass retail stores a few times over and never blinked an eye. I thought the figure was ugly and goofy, and at $20-25 USD, absurdly overpriced. Well, time came for me to have a cheap priced core for an Autobot combiner, and this guy just happened to be a good fit to team up with some Autobot cars (sorry Sky Lynx & Sky Reign, you�re quite ugly too) and also at a discounted price. 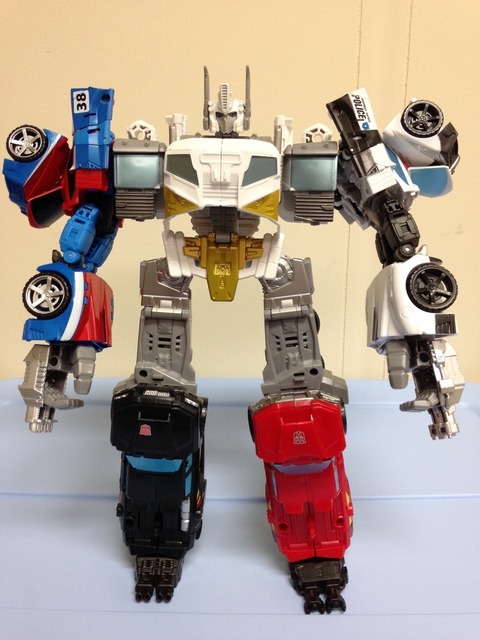 My goal was to create a combiner of BC Optimus, Prowl, Smokescreen, Trailbreaker, and Ironhide � goal achieved. I�m not sure if I�m pleased that I filled out my Autobot combiner at an inexpensive price, or if I�m disappointed that I bought such a goofy looking Prime. BC Optimus�s alternate mode is a snub-nose Semi truck of nondescript design. The coloration is a mottled mess of white (off-white compared to CW Prowl), metallic gold, grey, and darker metallic grey. There�s also some metallic light blue on the windows. The colors don�t exactly make this one a hot seller. The truck itself has a decent bit of detail here and there like side-view mirrors and smokestacks, but the color combination ruins most of what�s there. The cab is chunky and well proportioned, and everything tabs in rather nicely. The wheels roll well and the truck rolls along smoothly on a tabletop. It�s a well put together vehicle mode that is completely destroyed by an ugly paint job, in my opinion. 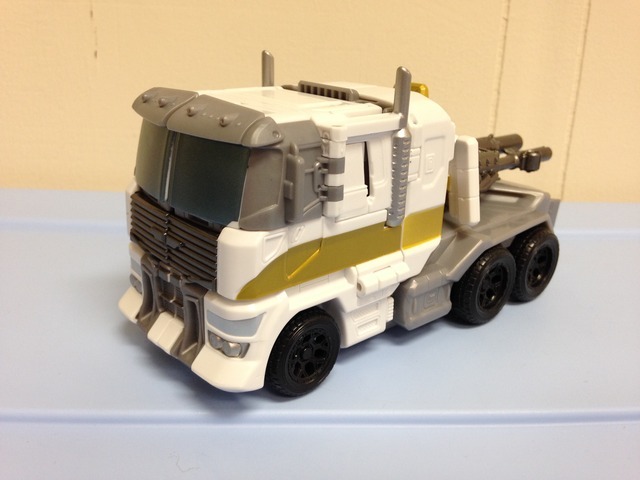 One nice feature is the way the weapons plug into the truck mode. Most of the CW figures I have do not have a good way to integrate the weapons into the alternate mode, leaving a bunch of appendages hanging off in random spots. BC Optimus has two pegs on the back of the truck mode, which the two large blasters slide nicely into. The blasters have been molded to look similar to exhaust pipes, which when tabbed in, look great and not terribly out of place. That�s pretty much the bright spot here. Putting BC Optimus into robot mode is a rather quick and easy affair for a Voyager size figure � quick transformations are a staple and bright spot of the Combiner Wars line. After getting Optimus into robot mode, however, you quickly notice that from the front he looks pretty good - on the back you�ll find a bunch of leftover parts intended for the combined mode. From the front side, BC Optimus is an imposing figure; big bulky shoulders, wide chest, and huge guns. Slide him sideways though, and you�ll get a view at his ridiculously thin waist and massive hunchback. It�s quite obvious the design is a combiner core first, everything else second. I don�t care much for the huge hunchback. It�s really just a storage spot for the Optimus Maximus head, and a place to plug Rodimus into when in combined mode. In robot mode though, it just looks way too bulky. There isn�t much to talk about with the color palette that hasn�t been said for the truck mode. Nothing new or interesting pops up, but at least the colors are spread out a little better making the robot more pleasant on the eyes. Where paint has been applied, the lines are crisp and clean. The head is painted well too. No light piping is used, but the paint apps contrast themselves well and the definition in the face is obvious. The new head is a positive note; it would have been easy (lazy) to simply use the old head and repaint it. Hasbro took the extra inch and made a new one � it�s a good way to differentiate Optimus with BC Optimus (aside from the ugly colors). Articulation is good all around with Optimus. Even though he�s got a hunchback, he�s pretty sturdy and well balanced. Hips and knees are tight (hips ratchet), shoulders and arms have a good range of motion (not hindered) and his waist swivels well. Optimus doesn�t have any ankles, but his feet are angled as such to provide some stability. 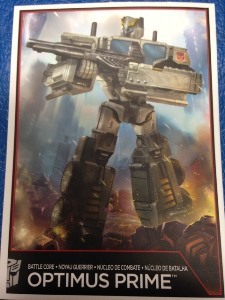 As previously mentioned, BC Optimus comes with two blasters, both done in dark metallic grey plastic. One is molded to look similar to his G1 rifle, the other� isn�t. It�s thinner and a bit shorter, but they can both be used separately or combined into one really long rifle � mostly for use in combined mode. Otherwise, there really isn�t anything noteworthy about BC Optimus�s robot mode. The main feature of the Combiner Wars line and the best feature of BC Optimus is making a 5 robot combiner with him. Transforming BC Optimus into the combiner mode doesn�t take long and is pretty simple. Attaching four limbs (whoever you choose) is also quick and easy. 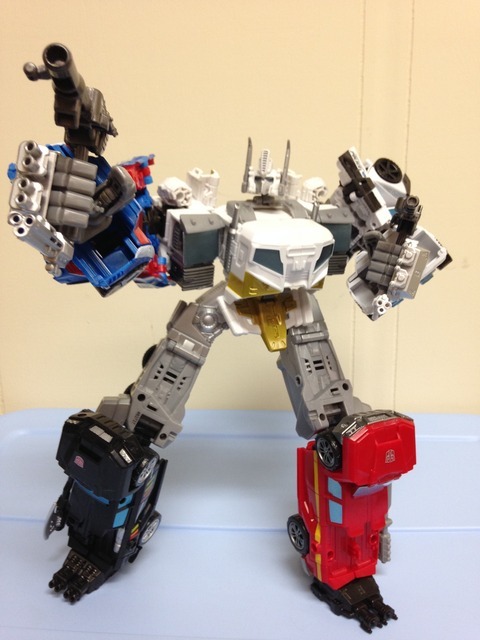 Once complete, Optimus Maximus looks like a force to be reckoned with. He�s a got a huge chest with a cavity that opens to plug in Rodimus (something I have not done) and also a molded Matrix of Leadership. It�s a neat little feature, and one of the shining spots of the figure. Unfortunately it�s molded in dull grey, leaving the feature a little bland. The head mold is neat, and looks like a natural progression from BC Optimus himself. Some might think that it looks slightly super-deformed, especially in the middle forehead area. It�s not a deal breaker, but it makes the head look a bit quirky. One major problem with the combined mode is the lack of tightness in the hips. While the hip joints are suitable while in his normal robot mode, Optimus Maximus cannot easily support the weight of the combined mode. The hips work OK, but it takes quite a bit of finesse to get him to stand correctly, especially if you shift his legs outward and he�s on a smooth surface. Balance tends to be an issue as well, which is exacerbated by the lack of tightness in the hip joints. Ultimately, this is a sad problem for a figure that would otherwise score a bit higher. The main function of the Combiner Wars line is to combine them, and instability in the combined mode leads to frustrating display and limited play options. Transformation Design: 6 Simple and not frustrating. Nothing more than that. Durability: 6 Nothing seems like it�s going to break, but he�s got weak hips. Not crazy about some of the tight tabs either. Fun: 5 This would be better if the combined mode was more stable. As is, there�s a lot more to be desired. Aesthetics: 4 The white/gold/grey deco isn�t terrible, but it�s bland. Where paint is present, things are crisp � the rest is just plastic. A skinny waist and a giant humpback don�t help. At least he�s got a new head mold though. Articulation: 8 He�s got some great mobility and nothing is hindered. 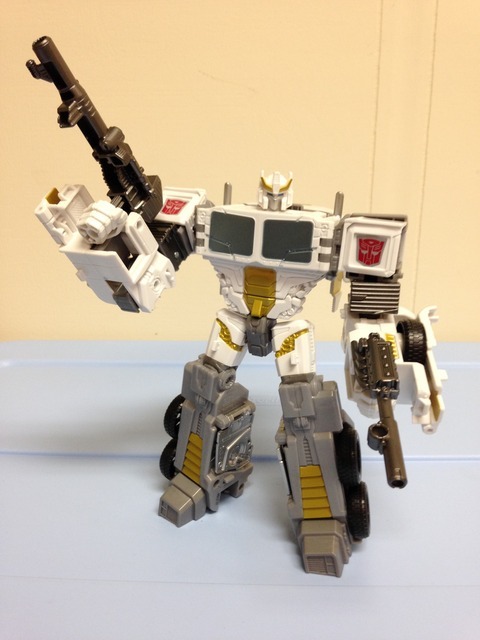 Value/Price: 4 At $15 USD, I still have a ping of buyer�s remorse � and that�s using him as a combiner! If I purchased him at full retail (~$25 USD) as a standalone, I would feel robbed. Overall: 4 BC OP isn�t terrible. He falls into the �meh� category. He�s kind of fun as a combiner, but definitely not on his own. The loose hip joints really kill some of the combined mode playability. I can�t recommend this one, unless you�re a diehard CW fan.